Arista is excited to introduce their brand new addition MicroBox-7824B-E02 into their industrial line of embedded computers. Featuring an assortment of highly versatile I/O, the unit is designed to compliment the tough needs of industrial automation. From being compact to cost-effective, MicroBox-7824B-E02 is an ideal companion for a myriad range of industries. MicroBox-7824B-E02 features superior connectivity options from dual gigabit Ethernet ports, 4 USB ports to single RS-232/422/485 serial port. The unit is powered by Intel Bay Trail E3485 1.91GHz ATOM CPU with expandable memory up to 8GB DDR3. The MicroBox-7824B-E02 supports both Windows 7 PRO and Windows 10 PRO. “After tremendous valuable feedback from our customers for the MicroBox B series, we are very excited about the new cost effective solution MicroBox-7824B-E02, it’s definitely a great addition with simplified features,” Tam Nguyen, Northeast Regional Sales Manager Arista Corporation. Click here to check out MicroBox-7824B-E02 on our website. Any questions or concerns, please call our toll free number 1-877-827-4782 Monday through Friday from 8:00am-5:00pm. To request a quote or product information, email sales@goarista.com. Arista Corporation is a pioneer in the industry of product development, engineering and manufacturing of industrial computers and displays. Founded in 1994, Arista has offices in China, India and Taiwan. 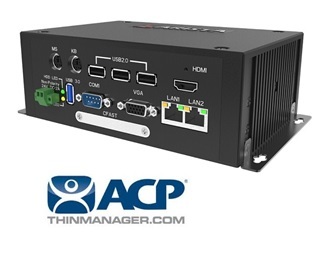 With years of experience and expertise in Industrial Panel PCs, Industrial Monitors, Box PCs and Fanless Embedded computers, Rack Mount Computers, ACP ThinManager Ready Thin Clients, embedded CPU Boards and video Extender/Switches. Arista has served customers with reliability, integrity and trust.